I'm dreaming of summer. This recipe says it all. I'm longing for 80 degree runs, beach vacations, everything that summer brings with it. Mostly warm weather, though. This winter has killed me. I created this pizza on a snow day, ironically. This is about the most summer-y pizza in the world, which is probably the reason I made it on a day that snowflakes were falling. Wishful thinking, Anna? Guilty as charged...Regardless of what's happening outside when you make this dish, I guarantee you will be delighted with the flavors (and the presentation)! One last thing to say..."Calgon, take me away!" 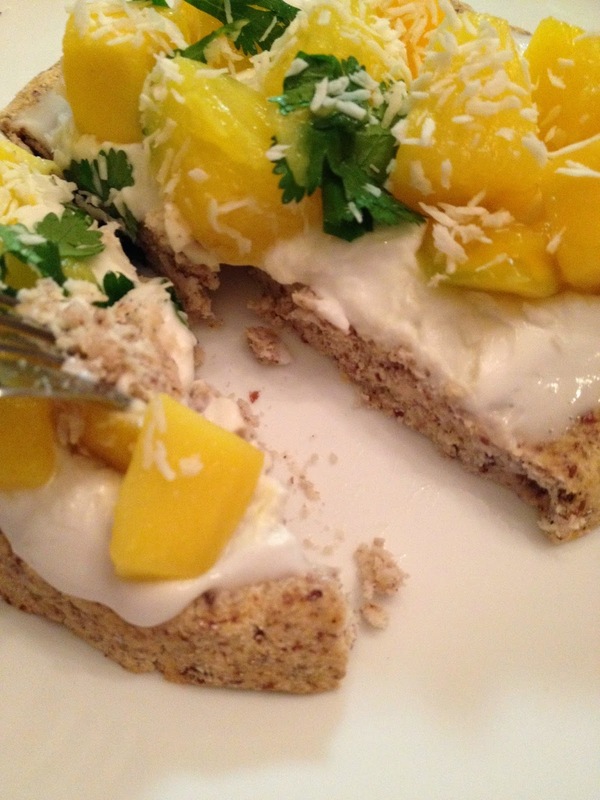 Tropical Pizza; Vegan, Gluten-Free; Makes one Pizza. In a medium size bowl, combine flour, vanilla powder, flax, and stevia. Stir well to combine. Add 1/4 cup water and stir. Gradually add in remaining 1/4 cup water-1/8 cup at a time. It will be slightly crumbly, but should still hold together. Roll dough into a ball and place in center of bowl. Pour about 1-2 Tablespoons water over ball and roll around. Place ball in center of parchment lined baking sheet. Flatten out into crust shape. You will have to work with it a bit, flattening out the cracks that form. Crust should end up being about 1 and 1/2 inches thick--don't flatten too much as it is more delicate than a grain-based crust. Place in oven and cook uncovered for 17 minutes. Remove from oven and let cool. While crust is cooling, prepare your topping. Add to a bowl mango and pineapple. Heat in the microwave for about 15 seconds to warm so flavors will mesh better. Remove and stir in cilantro. Let sit a few minutes for flavors to mingle. Top crust with coconut cream, spreading evenly. Place mango salsa on top. Sprinkle coconut flakes on top. Serve, slice, and devour! *The coconut cream will melt unless you let the crust cool considerably (you could actually place it in the fridge for a bit). IF you don't mind a melty cream, go ahead and top after about 7 or 8 minutes. *You can use frozen mango and pineapple if fresh isn't in season. Use same method for salsa preparation. I'm sure you've heard the old saying "don't judge a book by it's cover". Well, I've got a new one for you: "don't judge a burger by it's color". Seriously, though. Don't scrunch your nose up until you taste this baby. Oh. Mmmm. Yes. Creamy white beans combined with exotic coconut flavors and spicy ginger. It's may look unassuming, but this burger is hiding it's deliciousness. Packed with protein, flavor, and good-for-you fresh herbs (hello, ginger! ), this burger is the perfect addition to a meal, or can even be enjoyed as a snack. Coconut-Ginger Veggie Burger. Don't Judge. Coconut-Ginger Veggie Burger; Vegan, Gluten-Free. Makes one small Burger. 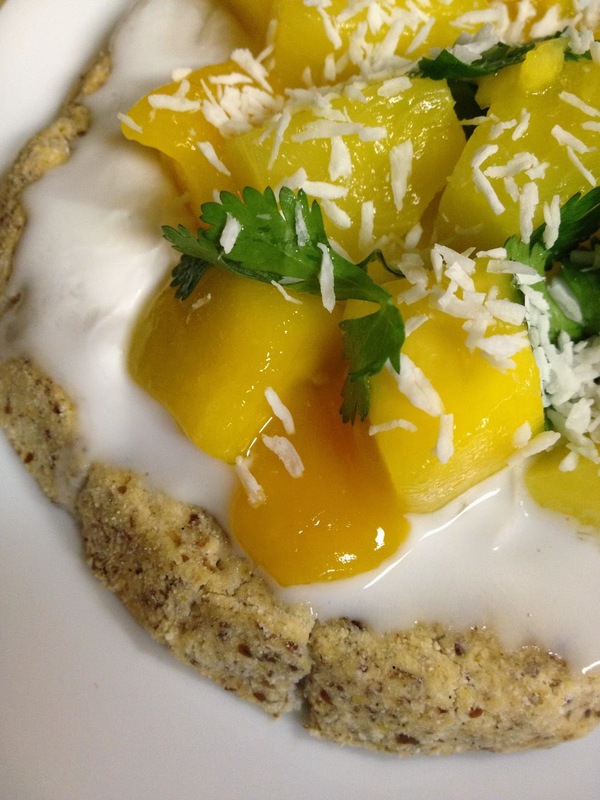 In a mini food processor, combine beans, ginger, coconut cream, and coconut. Process until smooth. Transfer mixture to a bowl and stir in coconut flour. Form a patty and place on skillet/pan. Cook 3-4 minutes per side. Serve warm. You reaaaallly want to make this burger. Trust me. The Big Vegan Breakfast Plate. This is what you eat when you want a big, filling, stick-to-your-ribs kind of meal. This is what you eat when you need something that will last you through that 3 hour business meeting, even if it ends up going longer. This is what you eat when you finish a Saturday morning long run and want a big, hearty brunch.This breakfast totally delivers. It will keep you going for hours. Loads of protein, lots of energizing carbs, and of course tons of veggies. Savory breakfast done right. The Big Vegan Breakfast Plate. Served with steamed pearl onions, carrots, and tomato-basil marinara sauce. The Big Vegan Breakfast Plate; Vegan, Gluten-Free. Serves one. Preheat oven to 170 degrees F. Line a biking sheet with parchment paper. In a shallow bowl, whisk together all ingredients except eggplant. Place eggplant sliced, one at a time, in marinade. Press into marinade to "absorb". Flip and press. Place on parchment. Repeat with remaining eggplant slices. Bake for one hour. After an hour, turn off the oven. Leave eggplant in oven for 15 minutes, after turning off oven. For the "Basic Tofu Scramble"
Heat a non-stick skillet over medium heat. Add a splash of water along with tofu. "Mash" tofu with spatula. After a few seconds of cooking, add nutritional yeast (nooch, as I like to call it) and spices, excluding pepper. Cook until heated through. Add liquid aminos and cook 1 minute. Serve and sprinkle with pepper. If you have a juicer, juice your spinach. This will replace most, if not all, the water called for in the recipe. If you don't have a juicer, place spinach in a Vitamix or other high speed blender and blend with a little water until mostly liquified. Alternatively, you can place it in a mini food processor and "chop" finely. It will not get liquified, but that's okay. In small-medium size bowl, add flour, spices, spinach liquid, and water (add a little at a time--it's better to add more as you go that to add too much at the beginning). Mix well, ensuring all flour clumps are gone. Pour batter onto heated non-stick skillet and cook 3-4 minutes per side. Makes 2 pancakes. Hummus. The word itself just makes me so happy. Add "Sundried Tomato and Paprika" before that little word? I think I just won the flavor lottery. Nommmmm. This hummus is full of that creamy chickpea-tahini goodness, with the bonus of tangy sundried tomatoes and spicy paprika. Mmmm. Served with a big plate of raw veggies and toasted pita bread, I think I could eat this at every meal and be perfectly content. Sundried Tomato and Paprika Hummus. Sundried Tomato and Paprika Hummus; Vegan. Gluten-Free. Makes 1 cup. Combine all ingredients in a mini food processor and blend until smooth (tomatoes will remain a bit chunky--this is perfectly fine). Scoop into bowl and sprinkle with paprika. Serve with veggies or spread on toast. Enjoy! Everyone loves a good salad. Especially if that salad has veggies AND fruits. Super yum. This is a nice, quick meal that is not only filling, but very hydrating and refreshing. Both cucumber and watermelon top the charts as having the highest water content of any fruit and vegetable. So this is what you eat after those super sweaty long runs in 95 degree heat (I'm looking ahead to the summer...it's actually snowing as I type this!). Cool, crisp, refreshing, delicious, and quick. What more could you ask for? Cold Cucumber-Watermelon Salad with Pine Nut-Mint Pesto; Vegan, Gluten-Free. Serves One. Arrange watermelon and cukes on a large plate (or in a large bowl). Sprinkle with dried basil. Add remaining ingredients to a mini food processor and process until finely chopped. Top salad with pesto and serve chilled. Note: You can add as much or as little mint as you want. If you want it really minty, add all four leaves. If you just want a touch of minty-ness, add only 2. Lollipop Smoothie; Vegan, Gluten-Free. Serves One. Combine all ingredients in a Vitamix (or other high speed blender) and blend until smooth. Pout into a glass and enjoy! Baked Beans are definitely a comfort food. They are an American classic, after all! I think the "comfort" part has a lot to do with the fact that many of us associate eating baked beans with happy times...at least I do anyway! When I think of baked beans, I think of family. Picnics, BBQs, holidays, warm weather, you get the point. If you're trying to recreate your favorite baked beans recipe, the one that is deliciously sweet and sticky, with smooth, buttery white beans that melt in your mouth, THIS recipe delivers. All the flavor, all the fun, and all the memories. Yummy Salad, featuring No-Bake "Baked Beans"
No-Bake "Baked Beans"; Vegan, Gluten-Free. Makes one small serving. In small soup pot, combine tomato paste, agave/maple syrup, and vinegar. Whisk together over medium heat until melty. Add beans and stir well to thoroughly coat in sauce. Cook for 5 minutes, stirring occasionally. Serve! You can use these as a salad topped, as I did, or serve them in a toasted bun, as a side dish, or you can double/triple the recipe to make a full meal. I remembered I had a big bag of Masa Harina Flour that I had bought for a cookbook recipe. Don't you love when a recipe calls for an ingredient that you buy, consciously knowing you will probably NEVER use it again, but buy it anyway because you REALLY want to make the recipe? Yeah. That's what happened in this situation...But I'm slowly discovering the wonders of Masa! Not only is it quick and nutritious, but it is so incredibly versatile and cheap. Sounds like a win-win to me (more creative Masa recipes to come soon...)! Mexican Pancakes with Un-Fried "Re-fried" Beans; Vegan, Gluten-Free. Serves One. Heat a non-stick pan over medium heat. Combine masa and water in a medium size bowl and stir well. The water measurement varies-I started out with 1/2 Cup and had to add considerably more to get the batter the right consistency. Spoon batter onto heated pan and spread around to form a pancake shape. Cook about 3-4 minutes per side. You will end up with 4 small-medium size pancakes. While pancakes cook, make your beans. Add beans to a small bowl and add 1-2 T water. Mash beans well with a fork. Add cumin, cayenne, garlic, onion, and oregano and mix well. Pop beans in the microwave for about 35 seconds--just long enough to heat them through (you could also do this in a small soup pot on the stove). Once pancakes are finished cooking, arrange them as you desire on a large plate. Serve with beans, sliced tomatoes, and salsa, if you wish. This dish is also great with fajita-style veggies as a side dish. I love Asian food. Always have, always will. It is definitely my all-time favorite ethnic food. I love to cook it, eat it, and, to be quite honest, LOOK at it (hey, come on-you KNOW vegan sushi is pretty beautiful, to say the least!). Chinese food definitely tops the charts when it comes to favorite Asian food. Nothing beats that garlicky, tangy bite that Chinese food provides. YUMMMMMMM. Paired with some steaming hot brown rice, you've got yourself a perfect meal. This stir fry was inspired by Isa Chandra's "Asparagus Stir-fry with Seitan Beefless Tips" (however I did not even look at the recipe before making this...I just heard the title and was intrigued to try and recreate it! )...that and the fact that I had some asparagus I needed to use, like, two days ago...! Szechuan-Style Seitan and Asparagus Stir-Fry; Vegan. Serves One. Prepare your seitan by bringing a small pot of water to the boil on the stovetop. In a bowl, mix together the gluten, onion powder, garlic powder, and poultry seasoning. Add scant 1/4 cup of water and stir together. Knead dough well in hands and form a log. Wrap TIGHTLY in foil, twisting ends and folding them in. Place seitan log in boiling water for 15 minutes. Meanwhile, set oven to 350 F to preheat while seitan cooks. Remove seitan from boiling water (with TONGS!) and place dirtily onto a baking sheet. Bake in foil wrap for 15 minutes. When finished baking, remove from oven and let stand, still wrapped in foil, for about 5 minutes to cool. Heat a non-stick pan over medium heat. Add liquid aminos and a splash of water. Add onion and garlic and cook about 1 minute, stirring regularly. Add asparagus and more water, if necessary, to prevent sticking. While veggies are sautéing, carefully unwrap your foiled seitan. Slice roll in half lengthwise, then chop into small bite-size pieces. Add seitan bites to veggie sauté. Cook, stirring occasionally, for 5-7 minutes, until seitan looks well-coated in sauce mixture. Serve! This is great with brown rice and fresh melon. Prepare to have your mind blown. I'm so not kidding. This is the best thing I have ever tasted. And yes, I know that is a VERY bold statement. And it's 100% true. The combination of flavors in this burger are unbelievably delicious. Heck, don't take my word for it--GO MAKE THIS RIGHT NOW! Spicy Raw Carrot Burger with Portabello Bun. Spicy Raw Carrot Burgers with Portabello Buns; Vegan, Gluten Free. Makes one Burger. Combine all ingredients (except mushrooms) in food processor and process until very finely chopped and well-combined. Scoop into hands, form into a patty and place on one of the mushroom halves. Top with remaining mushroom and EAT! Who doesn't love pizza?! And this pizza is the bomb dot com. Seriously. I went WAY out on a limb for the crust--a total experiment. I honestly didn't think it would work, but it turned out fabulous! Probably my favorite pizza crust recipe I've made. And this cheeze! Woah! So yummy. Enough rambling, Anna. Let's get to the good stuff. Spicy Pinto Pizza with Almond Cheeze. Topped with the most delicious tomato I have ever eaten. Seriously. Spicy Pinto Pizza with Almond Cheeze; Vegan, Gluten Free. Makes one pizza. Preheat oven to 350 F. Line a baking sheet with parchment paper and set aside. Place pintos in food processor with a splash of water and process until past-like. Transfer to bowl and stir in spices and flaxseeds. Roll into ball and flatten onto parchment. Crust should be no more than 3/4-1 inch thick. Bake uncovered for 15 minutes. While baking, prepare your cheeze. Place all cheeze ingredients in food processor and blend (scraping sides often and adding water as needed) until smooth. Note: this will take some time. It will take almost the flu 15 minutes the crust is cooking, but shouldn't take any longer. Remove crust from oven and spread cheeze over the top. Return to oven and bake 15 more minutes. Add desired toppings (I used a roma tomato and hot sauce which was AWESOME) and return to oven once more, baking for 10 more minutes. A couple years ago, I had this idea to create a bowl of oatmeal for each holiday. It has been so fun thinking of different ways to celebrate these special times of the year through healthy foods. As each holiday comes, I will post my "Holiday Oats" for that particular holiday. So here's St. Patty's Day: Sweet Vanilla Matcha Oatmeal. Let me just say...yum. I am a total matcha addict. I love it so much. I put it in everything almost! Smoothies, oatmeal, protein poppers; you name it, matcha goes in it. This oatmeal is absolute perfection. Definitely a favorite for any time of the year, not just on St. Patrick's Day! Sweet Matcha Vanilla Oatmeal; Vegan. Serves One. In a small soup pot, bring water to a boil. Reduce heat to medium and add oats, matcha, and vanilla. Stir continuously until desired consistency is reached. Top as desired and enjoy! Sweet Vanilla Matcha Oatmeal. Topped with "protein frosting": just mix your favorite protein powder with water until desired consistency is reached. Peanut Butter Protein Poppers. Say THAT one 5 times fast! Peanut Butter Protein Poppers; Vegan, Gluten-Free. Makes 8 mini "poppers". Simply add all ingredients to a food processor and blend until sticky and holds together. Scoop out 1 T of "dough" and roll into a ball. Repeat to make 8 balls. Place on plate, cover, and freeze for 15 minutes. I have to be completely honest. I don't miss any foods since going vegan. That's the case with the majority of the people I have talked to. However...I do miss the things you can do with yogurt. I ate tons of dairy products before I went vegan (the root cause of my stomach issues). I LOVED yogurt. Yogurt is the only thing I miss just a tad. Not the flavor, not the texture, but how it can be used. I loved making "yogurt messes", filled with berries, raw oats, seeds, and a touch of cinnamon. I have searched and searched (without any luck) for a soy yogurt or coconut milk yogurt that meets my picky requirements (clean ingredients, no added sugar, etc.). But alas, my search is over. This delicious vanilla "no-gurt" as I have named it is absolutely awesome. Subtly sweet, lusciously creamy; oh yeah. Yogurt mess, HERE I COME! Vanilla No-Gurt; Vegan, Gluten Free. Makes about 3/4 Cup. This couldn't be easier. Add all ingredients to a mini food processor and blend until smooth. Transfer to jar, cover, and refrigerate until ready to eat. You can eat this right away, too, but I think it tastes better if you let the flavors mingle for a few hours. Top with fruit, nuts, oats, use in overnight oatmeal, or eat plain! I'm a sucker for holidays. Especially the so-called "Hallmark holidays" (i.e. Valentine's Day, St. Patty's Day, etc.). I always have been, and I think I always will be! There is just such joy surrounding these days. People act happier when they know these days are close. Really! The colors, the decorations, and, who would I be not to acknowledge the best part...the food! I LOVE preparing holiday-themed recipes. In fact, as time goes on and I continue to increase my recipe collection, you all will be seeing LOTS of holiday-themes recipes. I'm cheesy, I know. I can't help it. I especially love St. Patrick's Day. Maybe it's my Irish heritage (come on, you had to have guessed. Check out the hair! ), or maybe the fact that my favorite color is EVERYWHERE for the entire month of March, or maybe that this holiday marks the beginning of my favorite season...I don't know. I just know I love St. Patrick's Day! Minty Shamrock Shake; Vegan, Gluten-Free. Serves One. Super-duper simple: Combine all ingredients in a Vitamix or other high-speed blender and blend low to high until smooth. Pour into large glass and enjoy! This is my basic "cheeze" sauce recipe that I use for anything that requires a cheese-type sauce. Quick and simple, there's not much too this recipe. It is very versatile, and you can experiment with additional spices to do spicy, savory, etc. Basic "Cheeze" Sauce; Vegan, Gluten Free. Makes One generous serving. Combine all ingredients in a small soup pot and whisk over medium low heat until bubbly and thick. This sauce thickens the longer it sits, so keep that in mind for use in your recipes. Use over pasta, veggies, in recipes, or over nachos. I love creating different pizza crusts. It's so fun to experiment with all the veggies you can turn into a pizza base! This crust, for example, was totally random. Usually I will start thinking of a recipe, take a couple days to mull over in my head what spices would work best, and finally, after about a week or so, try and create it. I'm not a very "fly by the seat of your pants" type girl. I like to have a plan. THIS recipe, however, was VERY "fly by the seat of your pants". It was Saturday night. I had gotten home later than planned (this usually is the case on Saturdays!) and needed to make something quick. I was planning on my "go-to" (raw veggies, tofu, oatmeal, and chia pudding), but when I opened the fridge door, I saw the beets I had bought earlier that week staring at me just BEGGING to be used. I looked at the clock, looked back at the beets, and grabbed them. I needed to use them anyway, so why not be a little adventurous. Turns out adventurous is good...really good. In a food processor, place beets and process until finely chopped. Add chickpeas and process until well combined...almost pureed, but still slightly chunky. Scrape sides as needed as you process. Transfer to a bowl and add almond flour and spices. Stir to incorporate. Roll into ball and flatten out onto parchment. Your crust should be about 3/4 inch thick. While crust is cooking, prepare your sauce. Place peas and coconut cream in food processor and process until smooth, adding splashes of water as needed. Remove crust from oven and let cool 5 minutes. Prepare any desired toppings. Spread cream sauce over crust and top with desired toppings. Slice and enjoy! I recently got a Vitamix and I absolutely adore it. I use it multiple times per day! From soups to smoothies to fresh sauces, dips, and banana ice creams, I don't know what I would do without my beloved blender. I have subconsciously been looking for excuses to use my Vitamix. I just love watching it work its magic. Turning beautiful fresh and frozen goodness into silky, delightful creations. This sauce was no exception. Fragrant rosemary meets bold beets meets silky white beans. Yum! Creamy Rosemary Beet Sauce; Vegan, Gluten Free. Makes just over 1/2 cup of sauce (enough for one bowl of pasta). So simple. Put all ingredients into Vitamix or other high-speed blender and blend until smooth. Pour over pasta, zucchini pasta, roasted veggies, etc. Pumpkin Overnight Freezer Fudge. Ready to eat. Pumpkin Overnight Freezer Fudge; Vegan, Gluten Free. Makes one small plate of fudge. 2 T "Better "N Peanut Butter"
Line a small size glass lasagna dish with plastic wrap. Set aside. Melt PB in a small soup pot with a splash of water. Stir frequently and add more water to prevent sicking and burning. In a medium-size bowl, combine pumpkin, protein powder, and melted PB along with cinnamon. Stir vigorously. Spread batter evenly into prepared dish. Cover and place in freezer overnight. Let thaw 15-20 minutes before serving. Remove fudge by peeling away plastic wrap from dish. Turn over onto large plate, and slice into chunks. Note: If you would like, you can add a little stevia before mixing ingredients. This kind of peanut butter is sweeter than normal peanut butter, though, so keep that in mind. I thought it tasted fine without additional sweetener, but it depends on your preferences. It's been a cold winter. Too cold for my liking. I hate the cold, to be honest (Ironic, considering I am a figure skater...). This winter has felt very loooooooong. Way too many single-digit days. Brrrr. I told my Dad that I think I have permanent goose bumps from being ceaselessly freezing since October. Not cool. When I'm cold, there is one thing I want: soup. Well, and oatmeal. But that's for a different post! This soup warms you from the inside out. This is the soup to eat on those single-digit "bone chilling cold" days. Creamy coconut milk, spicy curry, silky carrots, and just a hint of sweetness all packed into a delicious bowl of steaming hot goodness. Did someone say 10 degrees tomorrow? Bring It. Curried Carrot-Coconut Soup; Vegan, Gluten-Free. Serves One. Place carrots in a small soup pot and cover with water. Bring to a boil, then reduce heat and simmer until tender when pierced with a fork. Drain carrots in a colander and transfer to a vitamix or other high speed blender. Add beans, almond milk, and 1/2 Cup of coconut milk. Blend on HIGH speed for 45 seconds to 1 minute. Transfer soup back to small pot and stir in remaining 1/4 Cup coconut milk, curry, and stevia. Stir well. Cook until bubbles form on top and soup is heated through. Carefully pour into large bowl and garnish with coconut cream. Creamy Deliciousness, ready for devouring.